Britvic is investing in its Tango brand with the introduction of three new sugar-free flavours, a packaging redesign and a £2.2 million marketing investment that will see the brand back on TV for the first time in four years. The new variants are Tropical, Strawberry & Watermelon and improved recipe Orange sugar-free. Exclusively for the convenience and wholesale channels, each flavour is available in 59p or ‘2 for £1’ price-marked 330ml cans, and £1 or ‘2 for £1.70’ price-marked 500ml bottles. This is in addition to non-price-marked two-litre bottles (rsp £2.29), 600ml bottles, (rsp £1.39), 500ml bottles (rsp £1.39), 375ml bottles (rsp 99p) and 330ml cans (rsp 67p). 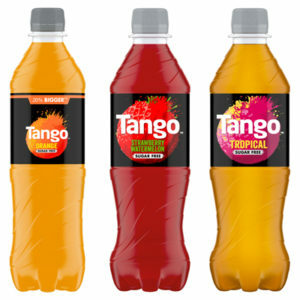 With the latest data showing that younger shoppers are the fastest growing age group buying low and no-sugar fruit carbonates, the more diverse flavours and modern pack design are aimed at helping to bring a new generation into the brand. Sugar-free is growing at a volume of 8% year on year (Nielsen), presenting retailers with an opportunity to drive sales by expanding their range in this area. The activity will be supported by the biggest spend the brand has seen in eight years, with a new TV ad this summer, sampling, digital and in-store activation.